Up your strength /check! Up your power /check! 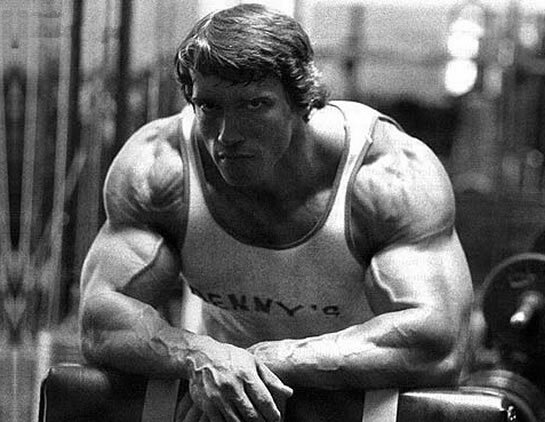 Up your muscle gains in the long term /likely! Intra-Set Rest Periods? No, that's not identical to "clustering" or "cluster training", although it may appear as if it was. Ok, let's briefly summarize what IRS / clustering is: Basically the idea is to perform the exact same amount of reps and thus work with a heavier weight than usual to induce greater gains (usually strength gains). Now how can you do that? Well, one possibility would be to simply add another set, so that you would now be doing 4 set of 10 reps instead of the usual 3 sets of 10 reps. Unfortunately, this is yet nothing but another instance of the notorious more helps more approach of which you should by now have realized that it is pointless and ineffective. It's easy to see, there is no black magic involved. 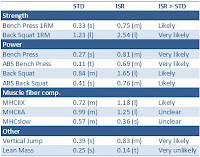 Same lifts, same plan, same progression, but different set x rep scheme and inter-set rest for the STD vs. ISR groups. In the fourth unloading week, tests were conducted and the same protocol was repeated with accordingly increased weights. All sessions were supervised and the compliance was 95% over the whole 3x4 week study period. Remember: This is not "clustering"! When you "cluster" your training volume will increase, the IRS protocol, on the other hand, is standardized in a way that the total workload will (and in in the study at hand did) remain the same. The participants of the study had all been doing upper + lower body resistance training for at least 2 years and were thus familiar with the basics of strength training, before the study they received nutritional counseling which is probably the reason that all of them increased their protein intake significantly (ca. +50g to ~190-200g/day; no inter-group difference). The same goes for the changes in muscle fiber and body composition. All subjects experience an increase in MHC-IIa fibers (glycolytic) and gained lean mass continuously. Unfortunately, they also gained body fat, so that the body fat % (DEXA measured) did not change at all. What did however react to the modified rest times were the changes in strength and power on all the major lifts. According to Oliver, et al. Table 2: Effect size and qual. inferences on intergroup difference; (t)rivial, s - (s)mall, (m)edium., (l)arge (Oilver. 2013). 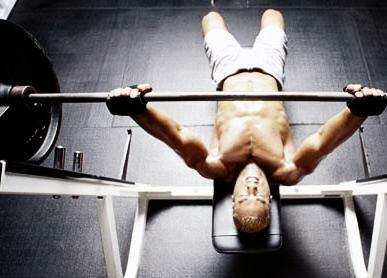 "Only subjects in ISR experienced an increase [in 1RM bench press & squats] at 4, 8 and 12 weeks. This corresponded to greater increases at 4 (ISR, 6.6±6.6 kg; STD, -1.4±6.2 kg; p= 0.012), 8 (ISR, 9.9±6.8 kg; STD, 2.9±5.8 kg, p = 0.016) and 12 (ISR, 15.1±8.3 kg; STD, 9.1±3.7 kg; p = 0.051) weeks. 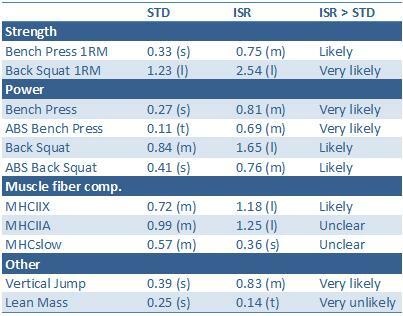 "Based on these results, it could be suggested the incorporation of ISR in the hypertrophic phase of a traditional or non-traditional periodized training program would allow for greater improvements in strength and power. What? Oh, yes... I will tell you if the researchers ever conduct this study. To be honest, I am yet pretty sure that this is not going to happen. After all, the results won't be patentable and since we are dealing with healthy people (worse athletes!) the governments of the Western Obesity Belt are more likely to burn a few additional millions to find new pharmacological methods to prolong the misery of the increasingly obese majority of their citizens - I mean, who would vote for them if they told people that we already had the solution to the obesity epidemic, but it was not available in convenient pill form?